Downtown Mooresville is the place to shop local! 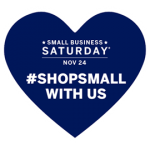 On Saturday, November 24, we would like to invite you to join Ain’t Miss Bead Haven, along with our Main Street neighbors, in celebrating Small Business Saturday. It’s a holiday shopping tradition that celebrates small businesses and hometown spirit! All of downtown will come alive with festivities and plenty of retail specials. Local shops are a great source for unique gift ideas, and Ain’t Miss Bead Haven has plenty to inspire you. This is also an excellent opportunity to come and mill about with friends and neighbors, and get a good solid start on your holiday spirit. So mark your calendar for Nov 24th — the Saturday after Thanksgiving — and get ready to #ShopSmall, #ShopLocal with us. Grab a friend or family member and come by Ain’t Miss Bead Haven between 10AM and 4PM. Thank you for all your support, and we’ll see you on Saturday, Nov 24th!